If you have never heard of the Bombay cat before, after you hear what we have to say about it, you may just want to get one. Let’s go over everything you need to know about this really beautiful looking cat breed. How much does a Bombay Cat cost? The Bombay cat is quite an affectionate and sociable cat that loves to be around its family. It will follow family members around the home all day long whenever possible. They also do not mind meeting new people, and are not against new environments either. They have a very calm, placid, and laid-back nature which makes them perfect for most homes, especially smaller places like apartments where there is not too much room to spare. The Bombay cat also does not mind other pets, as long as they are friendly, but do keep in mind that this cat wants to be at the top of the food chain in any dwelling, so to speak. The Bombay cat is not much of a hunter and they don’t really like puzzles too much either. However, they are moderately active in the sense that they like to play a lot. They love being taught tricks and they enjoy playing with toys and their human friends. Some Bombay cats even learn to walk on leashes, with a bit of training. These cats also love interactive toys. The name of the Bombay cat might imply that it comes from Bombay, India, but this is actually not true and this cat has nothing to do with the country of India whatsoever. The Bombay cat was bred by crossing American shorthair cats with Sable Burmese cats, with the goal of creating something that looks like a mini black panther, a goal which was more or less achieved. Nikki Horner, a breeder in Louisville, Kentucky, was the first to breed the Bombay cat in the 1950s. Her ultimate goal was to make a very sleek, shiny, and friendly cat that would make a good house pet, one with a muscular body.in 1978, the Cat Fanciers Association recognized it as an official breed, and now it is recognized as a breed by all cat associations. It might not the most exciting historical tale, but it did result in this fabulous cat. In terms of health, the Bombay cat tends to be a fairly healthy cat when it is fully grown. When they are adults, they really do not suffer from more or distinctive health issues when compared to other cats. 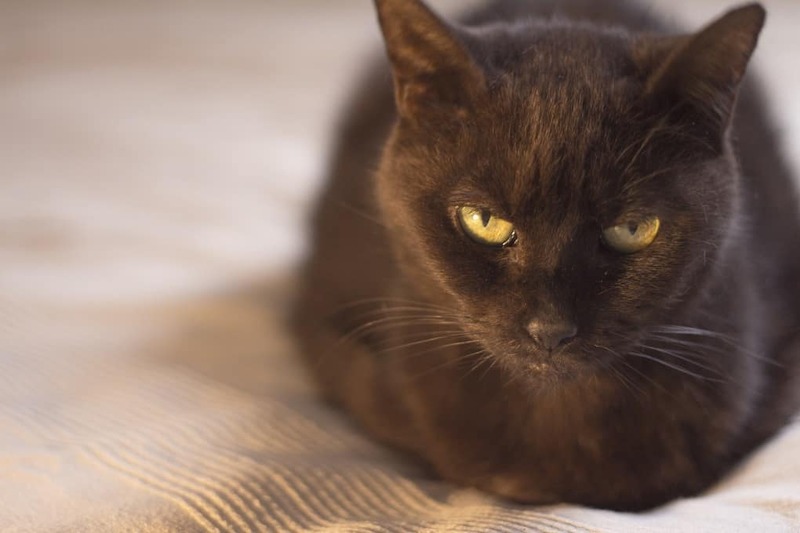 There have been some instances of arthritis, heart disease, and obesity, but these are not uncommon among all types of cats, not just with the Bombay cat. However, when it comes to kittens, there is a certain birth defect which the Bombay cat can suffer from, which is called a craniofacial defect. This is a malformation of the skull and usually always results in death or euthanasia, and therefore as somebody who is looking to buy a kitten, it is not something you would really have to worry about. The Bombay cat is not very demanding in terms of grooming. It has a sleek black coat, not much of an undercoat, and during most times of the year, shedding is not a big problem either. You do want to use a chamois or a really soft brush to give them a once over about once per week, just enough to remove dead hair and skin, and to distribute their skin oils. Bathing is rarely necessary unless they roll in something that you can’t stand the smell of. They do have a bit of an issue with dry skin, so bathing them is actually not the best idea, and if you do, use a moisturizing shampoo. You will also want to use a wet cloth to wipe out their eyes of residue every couple of weeks, making sure to use a different cloth for each eye. You also want to take a cotton ball soaked in 50/50 cider vinegar and warm water to clean out their ears about once per week. For the Bombay cat, it is also a good idea to maintain a regular oral hygiene schedule, as they may develop periodontal disease if their teeth are not well looked after. The Bombay cat is not overly large or long, but they do have fairly muscular, toned bodies, with a rounded head. The adult male Bombay cat can grow to around 10 inches at the shoulders, which is a decent size for a cat. Smaller specimen and females will often max out at around 8 inches at the shoulders. The Bombay cat can be quite diverse in terms of how heavy it gets. The largest of males can weigh up to 15 pounds, which is not all that small when you think about it. However, smaller specimen, especially females, can weigh as little as 8 pounds, with the overall average being somewhere around 12 pounds. The Bombay cat is a very calm and laid-back cat. They are not overly into hunting, exploring the home, or getting into cupboards. However, they do like to play and they like to play a lot. They don’t mind walking on a leash and the love interactive toys, such as a fishing pole and a string. However, the Bombay cat is also known for lounging around and doing nothing at all, especially in warm areas. They love to relax in the heat. No, the Bombay cat is not hypoallergenic. 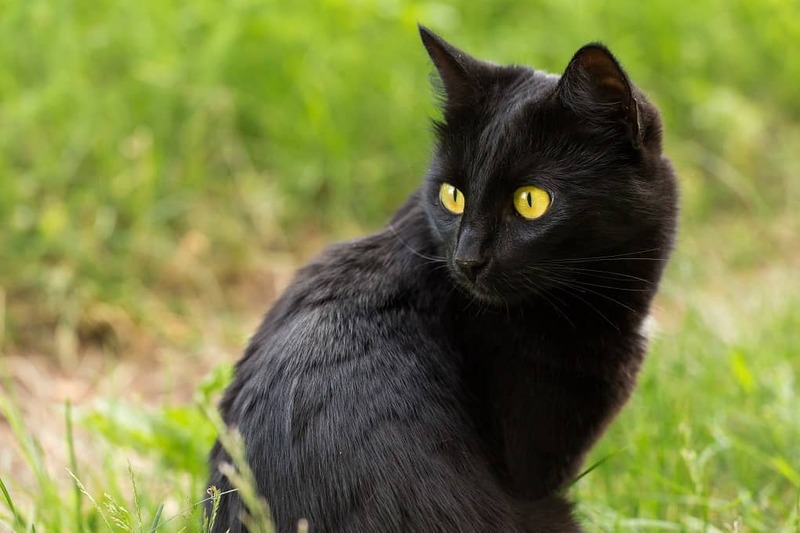 Actually, no cat is truly hypoallergenic, but the Bombay cat does not shed all too much, so they are not the worst for people with allergies, but also not the best. The Bombay cat is a fairly long lived cat as they can live to between 12 and 16 years of age if well cared for, with 14 or 15 usually being the maximum. The Bombay cat is not very hard to care for. Yes, they like to play a lot and be involved in whatever their humans are doing, but besides that, they are easy to care for. They are friendly, work well with most people and pets, they don’t require much grooming, and only need basic feeding. The Bombay cat is most commonly found in North America, but can also be found in other countries across the world. You definitely want to go to a reputable Bombay cat breeder that has looked into family lineage and health issues. You may also find the Bombay cat at an animal shelter, but be sure to check their health and personality before adoption. If you are looking to purchase a Bombay fat, you will end up paying somewhere between $500 and $700, which is not too bad all things considered. However, if you are getting kittens that were bred from a show cat, you could be looking at a price upwards of $2,000. For one, it is always recommended that you got to a reputable breeder that adheres to a strict code of breeding ethics. Moreover, as long as the parents are healthy and have a good personality, and you like the personality and the look of the kitten in question, there is not much else to keep in mind here. 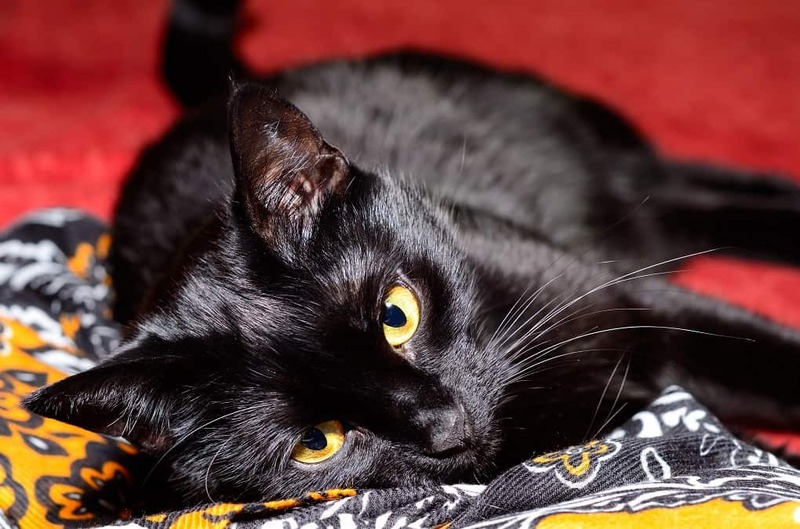 You need to groom the Bombay cat once per week, clean its teeth, ears, and eyes, provide it with a scratching post and lots of toys, good food, and lots of companionship. Yes, the Bombay cat does not like to be alone and they love to be with people, even to the point of sleeping in the same bed with its owners. It is not a cat to get if you are not home most of the time. The Bombay cat is very calm, relaxed, and laid-back. They like to play a lot and enjoy interactive toys, but they are a not much a hunter or explorer. You will often find them hanging out in the warmest areas of the home, even under the blankets in your bed. They usually do fine with kids and pets, and they won’t vocalize too much either. The Bombay cat comes in one pattern and one color, which is solid black. They have been specially bred to look like miniature black panthers. The Bombay cat is a very affectionate cat. Now, it might take them a while to get to know new people, but with their owners, they are quite affectionate. They do not really enjoy being picked up all that much, but they don’t mind sleeping in the same bed or taking a nap on lap. The Bombay cat is fairly good with dogs and kids. However, they do not like to be harassed or have their tail pulled, so whether or not it is dog- and child-friendly more or less comes down to the children and the dogs. Do keep in mind that all cats are different though. The Bombay cat is a fairly smart cat, although they are not usually known for doing things like opening cupboards or turning on taps. They do like interactive toys, can learn commands, and even learn to walk on a leash as well. Besides a lot of play, the Bombay cat is not overly energetic. It has a moderate energy level and it enjoys lounging around and doing nothing at all as much as it likes to play with string. All things considered, the Bombay cat is a fairly low maintenance cat breed. As mentioned before, while we are sure that there are some rare instances where there are abnormalities, this cat comes in a solid black coloration. As you can see, the Bombay cat is a fairly easy going cat that gets along well with most, is easy to care for, and doesn’t require much maintenance. It’s a pretty good family cat, especially if you and your kids love to play with fun loving cats.